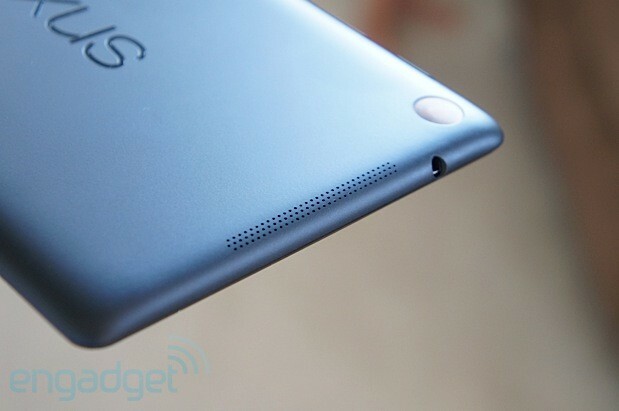 Who knew affordable tablets could be so good? That was our reaction after reviewing the original Nexus 7 when it went on sale last year for $200; at the time, comparably specced products were going for at least $100 more. So, when this year's follow-up came out at a slightly higher price ($229 and up), we were a little concerned the higher cost would dissuade penny-pinching shoppers from taking the plunge. After we got a good look at the spec sheet, though, we quickly forgave Google and ASUS for their decision. For the money, you get a gorgeous 1,920 x 1,200 IPS display, 2GB of RAM, a rear camera, a quad-core processor, wireless charging and the latest version of Android, Jelly Bean 4.3. Now that we've had the opportunity to take the new and improved Nexus 7 for a spin, we're ready to tackle all the obvious questions: is this still the best budget tablet on the market? How does it compare to the iPad mini? And does the spec sheet actually reflect real-world performance? Let's find out. 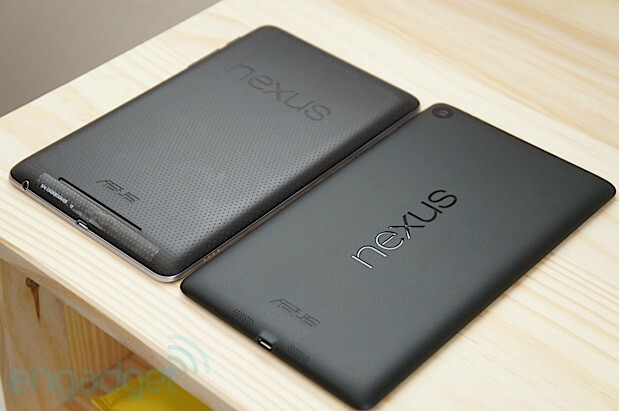 How would you rate the Nexus 7 2nd-gen? 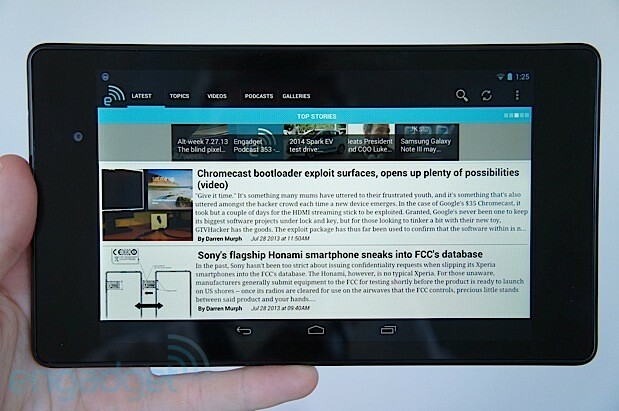 Behold: the Nexus 7 2.0. The latest iteration of Google's small tablet takes everything we loved about the original and improves on it, all without adding much to the price. Google and ASUS -- the OEM in charge of designing the new device -- whipped up the first Nexus 7 in just four months, an impressive feat for any company tasked with building a quality product. This go-round, the two tech giants had much more time to perfect the device, which bodes well for the quality here, we'd say. On first glance, the new Nexus certainly bears an obvious resemblance to its predecessor, but closer inspection shows that ASUS actually made a few significant changes. Weighing 10.23 ounces (290g) for the WiFi-only model and 10.55 ounces (299g) for the LTE version, it's quite a bit lighter than the first edition, which tipped the scales at 11.99 ounces. At 200 x 114 x 8.7 mm (7.87 x 4.49 x 0.34 in), it's 1.5mm taller, 6mm narrower and 1.8mm thinner as well. As you can imagine, then, while we didn't have a problem fitting the first tablet into our khaki pants pockets, this second-gen model is even easier to hold and tote around. In terms of aesthetics, ASUS eschewed the plastic faux-metal edges and the dimpled rubber back of the original, opting instead for an all-black, all-plastic exterior with a matte finish on the rear cover. We'll admit that the rubber on last year's device was an unconventional choice, yet it helped make the device feel surprisingly durable. And besides, the textured material just felt pleasant to put your fingers on. That's all been removed, likely in an effort to make the tablet as compact as possible. All told, the difference is subtle, but still noticeable: the new Nexus is still a very solid device, but it feels just a tad more... vulnerable. Fortunately, its matte back at least offers a good grip while staying (mostly) immune to fingerprints. Always a plus. On the front, the bezels surrounding the display are noticeably narrower -- ASUS shaved off about 2.75mm on each side -- but on the top and bottom they're as wide as they ever were. According to the two companies, the idea is to ensure most users will have a place to hold the Nexus while using it in landscape mode (this is especially handy for games, we've noticed). Since those bezels have remained the same size even as the tablet has gotten narrower, the front looks a little awkward proportionally speaking, given the screen's 16:10 aspect ratio. We suspect the top and bottom bezels could have been trimmed a bit too, and it wouldn't actually have had much of an effect on the user experience. While we're lingering on the tablet's front face, let's see what else is there. One thing you won't find on the device is a set of capacitive soft keys, since the Nexus 7 makes use of virtual navigation buttons instead. Above the display sits a front-facing camera, but it's curiously in a different spot than last time around. The OG version's camera was centered toward the very top, whereas this model puts the lens closer to the display and off to the right. If we had to guess, we'd wager that this was intended to make it easier to take selfies without worrying about your thumb getting in the way, but that doesn't explain why it didn't get pushed even closer to the right side of the device, since our thumbs still covered the lens on occasion. Under the hood, the 2013 Nexus matches the original's in total internal storage. While it initially launched with only 8GB and 16GB versions (at $199 and $249 respectively), Google dropped the baseline 8GB, lowered the price of the 16GB and added a 32GB model at the higher pricing tier. The Nexus 7 once again offers 16 and 32 gigs ($269) for now, although we'd certainly love to see a 64GB option come out down the road. Additional storage is important because the device still doesn't have a microSD slot, and we have a feeling that consumers will want to load the tablet up with HD movies and loads of music to take advantage of that sharper screen and stereo speaker setup. Obviously, then, storage space is of the essence. The model we reviewed is a 32GB WiFi-only unit, with 26.1 gigs of that storage space actually accessible to the user. An LTE version ($359) is also coming soon, though you can't buy it just yet. On that particular model, ASUS managed to squeeze six LTE frequencies (bands 1, 2, 4, 5, 13 and 17), pentaband HSPA+ and quadband GSM / EDGE into its North American version, which means it will be compatible with AT&T, Verizon and T-Mobile in the US, as well as a smattering of operators in other parts of the globe. This is actually a pretty huge feat, as we haven't seen a device that's compatible with both Verizon and AT&T LTE before. There's also a European option, which provides seven LTE bands (1/2/3/4/5/7/20), pentaband HSPA+ and quadband GSM / EDGE. Not too shabby. Finally, anyone who enjoyed the optional dock with the first Nexus 7 will be disappointed to see that it's MIA here. The new tablet does, however, offer Qi wireless charging out of the box. We tried it on multiple charging pads, including the Nokia Fatboy, Energizer dual pad and Samsung GS4 pad, and it worked perfectly every time. If you're not equipped, you might at least be pleased to know that iFixit's teardown of the device revealed a Qualcomm PM8921 Quick Charge Battery Management IC, which allows for faster charging than conventional plugs (as long as you're using compatible adapters). When the Nexus 7 debuted last week, there wasn't any confusion as to which feature Google most wanted to emphasize: the display easily got the most lip service during the event. Last year's model had a perfectly acceptable 1,280 x 800 pixel IPS LCD panel, which was more than reasonable for a $200 tablet. In this industry, however, a "perfectly acceptable" screen can magically transform into a piece of junk in a matter of months. Not to worry, though, as the new Nexus 7 has an increased resolution of 1,920 x 1,200, which translates to a pixel density of 323 pixels per inch, up from a puny 216 ppi on the OG model. This is a massive improvement, and that improvement is obvious just as much in side-by-side comparisons. We know this can easily be said of any 1080p (or equivalent) screen, but the Nexus 7's display is simply beautiful. It offers more natural colors than the last-gen model, with amazingly crisp fonts and a generally much better canvas for playing games or watching movies. At the risk of sounding like we're making a shameless plug (we sort of are), we loaded up the latest issue of Distro on both tablets. In short, the difference is astounding: the text here is bolder and easier to read, and the high-resolution screen exposes details in images that we simply couldn't see on the older screen. This isn't constrained to just Distro, of course; we noticed this with all the media we viewed. On top of all that, the screen delivers some great viewing angles, and is bright enough that you should have little problem reading it in direct sunlight. Simply put: the display itself is top-notch, but the fact that it's built into such an inexpensive tablet is even more impressive. In fact, it's a good enough reason you might want to seriously consider grabbing one of these for yourself. With new Nexus devices, Google typically introduces the next version of Android along with them. Unsurprisingly, then, the tablet comes with Android 4.3 out of the box. This piece of firmware still has the same Jelly Bean name Google has been using since version 4.1 debuted on the original Nexus 7 last year. Frankly, not a whole lot has changed this time around, but that doesn't mean everything has just stayed the same since the last upgrade came out almost nine months ago. "Suppose you have device sharing enabled and then a call comes in. Who gets it? Do you punch through to the current user? Only the owner gets it? If only the owner can answer, does it ring for the second user? Is it worse to annoy the current user with a ringing phone they can't answer, or worse for dad to miss a call from his boss because Junior was playing Angry Birds?" We wouldn't expect to see multiple user support on Android phones right away, but it appears that the issue is at least on Google's radar, so hopefully a solution is on the way. If you're a sucker for beautifully designed games with smooth graphics and copious detail, you may have been waiting for Open GL ES 3.0 to show up on Android. Fortunately, 4.3 officially supports the standard, and is currently available on the Nexus 4 and Nexus 10, in addition to the tablet we're reviewing today. Essentially, ES 3.0 brings acceleration of advanced visual effects, texture compression, 32-bit floating point support and more. There's also improved multi-threading across multiple CPU cores. Android 4.3 also adds support for Bluetooth Smart, LE and AVRCP 1.3. For the uninitiated, Bluetooth Smart includes APIs that allow apps to access and receive your stream of notifications, and then display them however they want. Since this includes sending your status bar notifications to Bluetooth devices, this particular announcement is great news for users of wearables (think about what it could do for the Pebble smartwatch or even something like Google Glass). Bluetooth Smart is already available on the new Nexus 7 and the Nexus 4, with more devices to follow. AVRCP 1.3, meanwhile, ensures that users get better remote control functionality and more interactions with streaming media devices. Lastly, users have already uncovered an easter egg in Google Play Games that involves the Konami code. 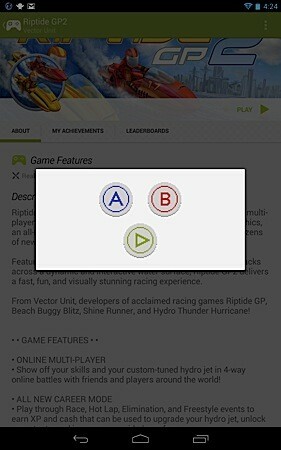 Swipe up, up, down, down, left, right, left, right and a box will appear with three buttons: A, B and start. You know what to do next; once you're done, you unlock a special achievement called "All your game are belong to us." We were able to forgive the absence of a rear-facing camera on the original Nexus 7, because let's face it: tablets aren't exactly known for being stellar imaging devices. Of course, we're not going to complain that ASUS threw a camera in on the second-gen model; our expectations just aren't as high as they would be for, say, the Nokia Lumia 1020 (or anything else of that ilk). Since we just finished our discourse on the new features in Android 4.3, we'd be remiss not to discuss the camera app. As usual, you'll find the virtual shutter button and camera mode toggle switch (this is where you can change into panorama, video or photo sphere mode), though a dedicated settings key sits above both of these. Pressing this (or long-pressing the viewfinder) brings up a few options displayed in the form of icons above a small arc. It gives you the opportunity to switch to the front-facing camera, tweak exposure or go into more settings, not that there are many. You have white balance, scene modes (night, action, sunset and party), timer and picture size at your disposal, but no HDR, ISO, shutter speed or any other type of adjustment. It's probably for the best anyway, since most images taken with a tablet camera will likely just wind up on Facebook, if you share them at all. We half-expect every tablet camera to be a terrible piece of kit, but for what it's worth, the Nexus 7's five-megapixel rear shooter is actually a decent performer -- though it's not without its hiccups. 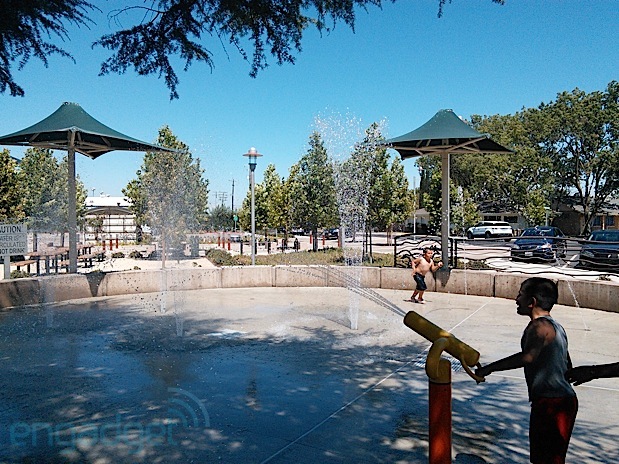 Images are fairly detailed, though the colors become a little washed out in sunlight and pictures are generally very noisy in low light (there's a night scene mode here, but it doesn't actually do much more than the default auto mode). The camera also couldn't reconcile shadows and highlights at the same time, so shady areas came out much darker than we would have liked. That being said, the shutter snapped pics fast enough for us to capture a few family memories without any motion blur. It also offers autofocus, another nice feature not found on a large number of tablets. Also, our images taken in low-light situations captured more light than we expected, even if we couldn't do anything about the noise. To us, the front-facing camera is more important on a tablet than the rear; chances are, you'll be using the tablet for video chats more than you'll be taking impromptu snapshots. It's a 1.2MP module up front, and it isn't at all memorable compared with what you'll find on other tablets. Still, it managed to capture my facial features pretty well, regardless of whether I was using it in sunlight or in a dim room after dark. Just like on the rear camera, though, there's still a ton of noise in lower-light situations. Our video samples were in roughly the same shape as our stills: not acceptable on a flagship smartphone, but right on par with what you'll get from a typical tablet. The Nexus 7 records video at a max resolution of 1080p at 30 frames per second, with a bitrate of 12 Mbps. The camera managed to maintain its focus no matter how many times we moved around. Of course, the lack of optical image stabilization means our footage was a little shaky at times (though it wasn't any worse than on other devices that also lack this feature). Pans were much smoother than we expected, and the mics picked up audio without much background noise to distract us. Unfortunately, despite the tablet's 1080p video capture spec, the resulting movies were far from actual HD quality. SunSpider: lower scores are better. Both devices were tested on Android 4.3. 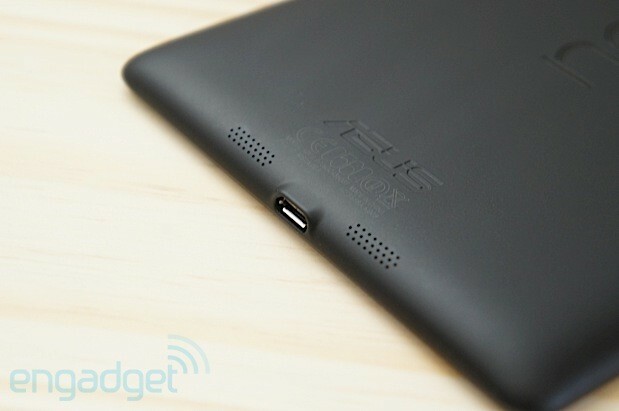 Last year, Google and ASUS impressed us when they delivered a tablet with an NVIDIA Tegra 3 processor for under $200. Sure, it wasn't without issues, but overall it still offered solid performance for such an inexpensive device. Alas, NVIDIA wasn't invited to the party this time out: last year's quad-core, 1.2GHz Cortex-A9 chip (40mm) was swapped out for a smaller 28mm chip, a 1.5GHz quad-core Qualcomm Snapdragon S4 Pro (APQ8064) with Krait 300 cores, an Adreno 320 GPU and a very healthy 2GB of RAM. 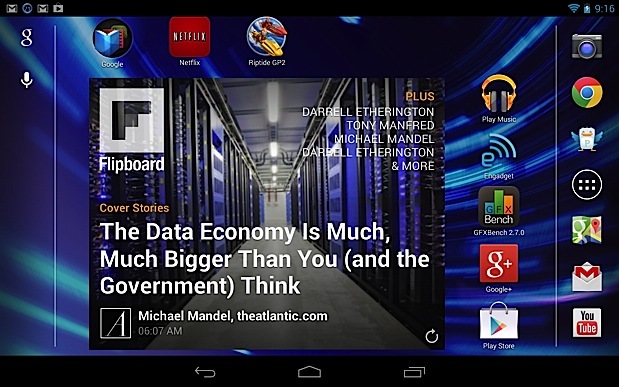 The Snapdragon S4 Pro inside the new Nexus 7 has already been surpassed by the Snapdragon 600 (and soon the Snapdragon 800), but it still purrs along quite speedily. As you can see by the benchmark scores, the device is a huge improvement over the original. In real-life use, the tablet was amazingly responsive and didn't show any lag, stutters or other symptoms of an overworked processor. Not bad, considering the new chip has to power that higher-res screen. The Adreno 320 GPU featured here is one of the best you can get. Between that and Android 4.3's GL ES 3.0 support, we spent plenty of time enjoying Riptide GP 2.0 to its fullest extent. ASUS has definitely taken the graphics up a notch; we could see an incredible amount of detail in the water, our avatar and our surroundings, and we never encountered any sort of disruption that interfered with the gameplay. Since ASUS has made a considerable effort to slim down the new Nexus, we suppose it shouldn't come as much of a surprise to find that the battery is also smaller: it's been shrunk from 4,325mAh to 3,950. This was worrying at first, especially given the extra pixels that need to be lit up. In normal use, we discovered that the device could easily last us at least a day and a half, and we could certainly push it longer by being more conscious about preserving battery life. Gaming and multimedia were unfortunately different stories: we drained the battery nearly 30 percent in just one hour of playing graphically intense games like Riptide. Our video rundown test, which consists of a 1080p movie playing back on an endless loop with the display on 50 percent brightness, yielded a life of seven hours and 15 minutes, which was much poorer than last year's Nexus 7. That tablet lasted nine hours and 49 minutes in the same test. The high-def display isn't the only area where Google and ASUS improved multimedia playback: we also noticed a massive upgrade to the audio quality as well. As we explained earlier, the biggest change is the addition of an extra set of speakers on the top of the device, which means the new device offers stereo quality (rather than the mono setup found on the previous version). The companies also partnered with Fraunhofer Cingo, which saw to it that Google Play movies can be watched in HE-AAC multichannel surround sound. Without question, the new Nexus is definitely loud enough in nearly every scenario. Our only quibble -- and it's a small one -- is that lower frequencies don't sound as prominent when you're listening through the speakers, so to get more complete bass you'll still want a good set of headphones. There's no shortage of smaller-screened tablets in the market, but the most talked-about are arguably the Nexus 7 and the iPad mini. Since we've already compared the new Nexus 7 to its older counterpart, let's see how it holds up against its iOS competitor. The iPad mini starts at $329 for the 16GB WiFi version, a hundred dollars more than the Nexus; the 32GB WiFi is $429, a difference of $160; and the 32GB LTE option costs $559, $210 more than Google's equivalent. Granted, the iPad mini's display is an inch larger than the N7, which might affect the cost of the tablet. That said, how else does it compare? Naturally, the decision between iOS and Android plays a huge role in the decision-making process, and you'll want to weigh the two platforms very carefully. Diehard iOS users, for instance, would likely find it difficult to switch to Google's mobile OS because they'd have a lower number of dedicated tablet apps to choose from; heck, most Android smartphone users probably have the same complaint. This is a problem the iPad mini simply doesn't have, which may inherently give Apple a leg up, higher prices or not; it also gets brownie points for having a better battery. Looking strictly from a budget and spec standpoint, however, the $229 Nexus 7 offers an insane amount of value that bests the iPad mini. The display is the best we've seen on a small tablet, the stereo speakers offer amazingly loud audio, the performance stands up to gaming and other intensive tasks, and you get NFC, wireless charging and enough cellular radios to make it compatible with three of the big four US carriers. 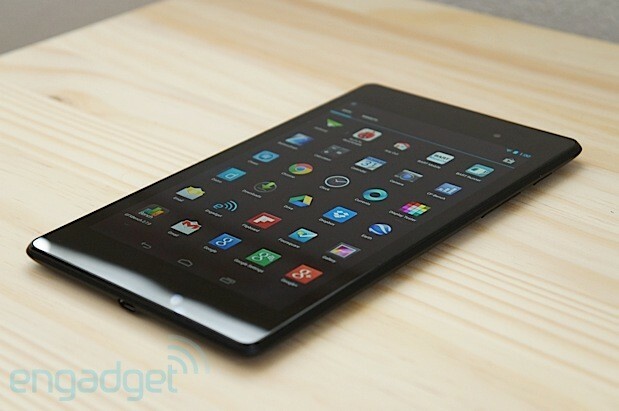 If ecosystem doesn't play a large factor in your decision, we heartily recommend the new Nexus 7. 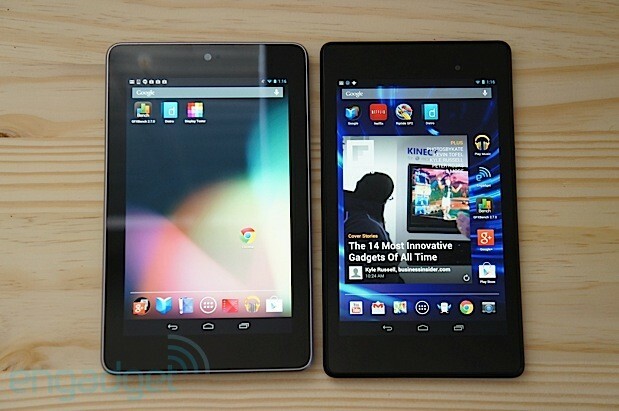 When the first Nexus 7 came out, we applauded Google's willingness to sell it for less than $199. Even though the new version is an extra $30, we can confidently say it offers the best bang for your buck -- yes, that includes the iPad mini, though Apple's entry in the small tablet category has a much more diverse catalog of tablet-specific apps. Granted, Android is slowly but surely improving its selection, but it still has a long way to go before it catches up. That frustration aside, the new Nexus has a lot to offer, including an incredible display and strong overall performance. As long as you don't mind the selection of tablet-optimized apps in the Play Store, you'd have to be an extreme power user to not enjoy the latest Nexus 7, and you'd most definitely be paying through the nose to land anything better.